Now that it has been received by MBS1, I am happy to display the Celtic Neckwarmer I knit for her using Sean Sheep Rockbank soy/wool blend. 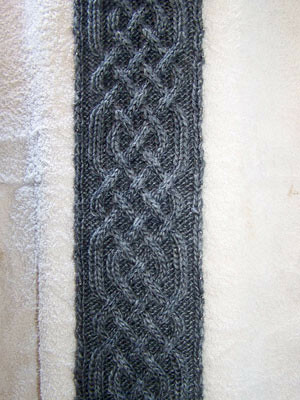 This is a pattern by Lindsay Henricks who blogs about it here. It’s also on Ravelry here. I’m only showing it flat. It is actually a very short scarf which buttons at an angle. It has buttonholes in the pattern at one end. Cabling is not nearly as hard as it looks but in a pattern like this where the lines cross back and forth at varying intervals it’s hard to memorise. I had to watch the chart all the time to know what to carry where. I was quite glad it was only a short scarf! MakeBaker 1 can attest that this is a soft and stylish number. Thanks!